There is not, in the whole range of our sea-side physiology, a more lively, bustling place than this said Margate: albeit, by those who are fettered down to cold formalities, and regard laughter as a positive breach of good-breeding, it is pronounced to be essentially and irredeemably vulgar. The streets are always a scene of continued excitement, and troops of roguish, ruddy-cheeked urchins, escorted by their mammas or their nursery-maids, traverse every thoroughfare about the town from morning until night. There is a theatre also, and a kind of minor Vauxhall, called the Tivoli, where those who care little for out-of-door enjoyments can spend a passable hour in such dramatic and musical gratifications as the artists and the place can best afford. 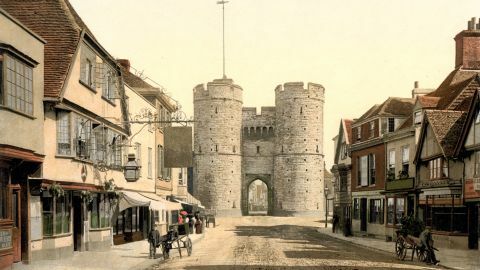 Bazaars and marine libraries afford too, in “the season,” the latest metropolitan vocal novelties; and the same raffling and rattling of dice-boxes, to test fortune’s favouritism, is carried on as at Ramsgate, but with a greater spirit of freedom and earnestness. 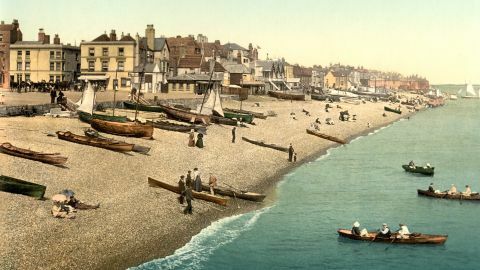 In short, for those who do not go to the coast for retirement, and who like to have an atmosphere of London life surrounding them at the sea-side, there is no place where then- desires can be so easily and comprehensively gratified as here. The increasing extent and importance of the town makes one regard the traditions told of its early origin as being nearly akin to the fabulous, yet a few centuries back, known to the local chroniclers as coeval with the period of “once-upon-a-time” Margate was a small fishing village, with a few rude huts thrown up along the beach, and having a mere or stream flowing at that point into the sea, whence it derived its present appellation. When London fonts, however, grew wiser, and found that short trips had a wonderful power in preventing long doctors’ bills, the place grew rapidly into repute, and the old Margate hoy – immortalised by Peter Pindar – disgorged its hundreds of buff-slippered passengers annually. Since then steam has done wonders, and Margate visitors have to be numbered by hundreds of thousands in the same space of time. The only drawback to its salubrity as a place of residence is that a cold cutting north-easterly wind is frequently encountered, and not being sheltered by a range of hills, the effect on an invalid of delicate constitution is of rather an injurious tendency than otherwise. But this apart, the air is keen, fresh, and invigorating-, and, with persons in good health, will have a material influence in keeping them so. It is generally a few degrees cooler in July and August than Ramsgate. The sixth day of April, 1810, saw the commencement of the present pier, and five years afterwards it was finished from a design by Rennie, and at a cost of £100,000. It is nine hundred feet in length, sixty feet wide, and twenty-six feet high. A day ticket for one penny will not only give admission to the promenade, but afford an opportunity besides of hearing a band perform for a few hours in the evening. There is a lighthouse at the extremity, which is an elegant ornamental Doric column as well, and was erected in 1829. At an expenditure of £8,000 the well known Jarvis’s Jetty was constructed in 1824, out or the finest old English oak that could be procured. 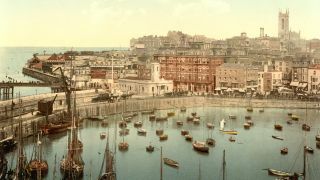 It extends 1,120 feet from the shore, and forms a pleasant cool promenade when the tide is out, although a scurrilous wag has compared it to walking along an excessively attenuated cold gridiron. 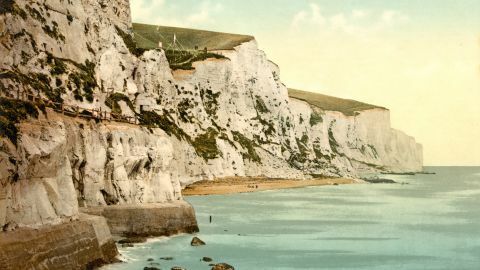 The Clifton Baths, by the Fort, cut out of the chalk cliffs, arc unquestionably the most commodious, and have some interesting appendages in the shape of a library, winding passages, curious vaults, daily newspapers, and an organ. The other bathing-houses, though well conducted, are of a more ordinary character. Margate being situated partly on the acclivities of two hills, and partly in the valley below, the streets partake of that tortuous and undulating character which is so much pleasanter to look at than to climb. On the Fort, in front of East-crescent, the handsome structure of Trinity Church is conspicuously situated, and to the south-east the old parish church of St. John occupies a similarly elevated position. In this latter there are some curious old tombs and monumental brasses that should not be forgotten. A literary and scientific institution is supported by the annual subscriptions of the inhabitants, and has a library, lecture-room, and museum, that may vie with any out of London. Extending about a mile along the shore there is a stout barricade of stone, erected as a defence to the incursions of the sea, at an outlay of £20,000. The sum of £4,000 more rebuilt the Town Hall and Market Place in 1821; and from this it will be seen the townsfolk have not been chary of their coin in contributing to the security and embellishment of their native place. Inns and hotels of every grade are scattered in and about the town with prodigal luxuriance, and lodging-houses are everywhere. The staple manufacture of the landladies here may be set down as — beds. The tourist should not neglect to pay a visit to Salmanstone Grange (1 mile), a manor farm of St. Augustin’s at Canterbury; the Infirmary and the Chapel in the pointed style, are yet entire. In the vicinity, likewise, are Dandelyon (1½ mile), the gatehouse of the ancient seat of the Dandelyons, a curious old structure, and Dene Chapel, in ruins (2 miles), erected by Sir Henry De Sandwich, in 1230. Races are held on the downs, by Dandelion, in the middle of September, and generally attract a large concourse of spectators.